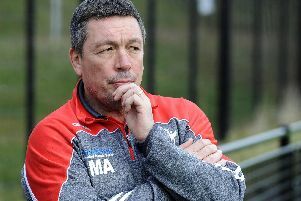 The recent victory over Barrow Raiders carried some extra significance for Sheffield Eagles director of rugby Mark Aston after a difficult week for the family. The Eagles came together prior to kick-off to hold a minute’s silence in memory of George Betts, Aston’s father-in-law, who passed away in the week prior to the game. It was an emotional day for the Aston family, with Cory Aston bagging a brace of tries which ensured the Eagles made it back-to-back victories, and moved them six-points clear of the relegation trap-door. After the game Aston Snr declared it was fitting that Aston Jnr played such a pivotal role in proceedings, whilst also taking time to acknowledge the role Betts played in his own career. “We lost George this week, so to get the win was a nice way to send him off,” an emotional Aston told The Star. “We lost him last Sunday, and it was as if he waited until we won the game last week before going to sleep. "He's been a top man for me. "Since I met Dawn in 1992 he has been through everything with the club. "We have been through so much together. We moved into his house, and then he moved into ours when we had the floods. "He has been an absolute champion for me, so it was a good way to send him off by winning again. “Everyone talks about him being a gentleman, he had a lot of time for everybody. "The people like Menzie Yere, Quentin Laulu-Togagae and Misi Taulapapa - the overseas lads - they all thought he was like a dad to them. The victory has now moved Aston’s side into eighth place, with one round of the regular season remaining before the end of season split. After a worrying start, the recent run of results have put the Eagles within touching distance of Championship survival, although they still have their off-field issues to address before they sit too comfortably. Aston is now looking at next weekend’s game against Leigh before offering his side some downtime, knowing one last push will get them over the survival line. “It is about scraping through, and firstly getting to 14 points," he added.